Most of the people are unaware of the power of Visual workflow (Flow) in Salesforce. You can minimize the code usage in your organization by using flow. It’s a tool whereby drag and drop you can build awesome screen without writing a single line of code. 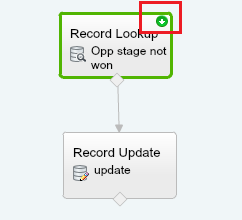 You can even insert, update, Delete record in Salesforce, all you can do without writing code even Salesforce administrator can use flow very easily. 1) In Universal Container, Sales manager want to capture Sales rep feedback on the Closed lost opportunity. They want a screen will pop-up, as soon as Opportunity Stage is updated with Closed lost and save the feedback data on Feedback object that is a child of opportunity. 2) In an account, we can create a number of Opportunities. Sales manager in Universal Container want to update all opportunity Stage = Closed lost except for those whose stage is updated by Sales rep as Closed won for the same account. How to start with Visual workflow (Flow). Save this flow and you are all set to test it out. 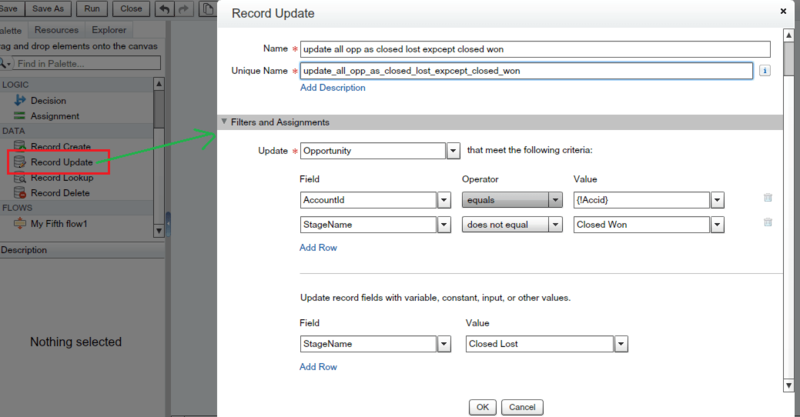 After Spring’14 release you can launch flows from workflow rules, it will remove any user interaction to launch it or any code to launch flow. So you can write a workflow rule on the opportunity and use immediate action (Flow) to trigger it. To learn more about Flow Trigger Considerations click on the link. An unhandled fault has occurred while processing the flow. Please contact your system administrator for more information. The flow tried to update these records: 0061I0000028E0JQAU. This error occurred: ALL_OR_NONE_OPERATION_ROLLED_BACK: . For details, see API Exceptions.—The flow tried to update these records: 0061I000005MixgQAC. This error occurred: ALL_OR_NONE_OPERATION_ROLLED_BACK: . For details, see API Exceptions.—The flow tried to update these records: null. This error occurred: REQUIRED_FIELD_MISSING: Required fields are missing: [Discount_Percent__c]. For details, see API Exceptions. This report lists the elements that the flow interview executed. The report is a beta feature. We welcome your feedback on IdeaExchange. Charu Agarwal (0051I000000Q99y) started the flow interview. Update the records’ field values. 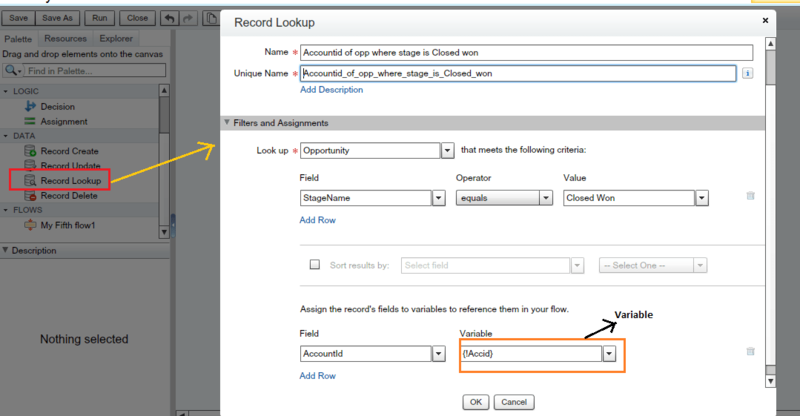 Failed to update records that meet the filter criteria. I am hoping to get some solution on my requirement ,when Account owner is changed,defaultly,Opportunity owner changes too,but it doesn’t trigger Opp owner adding to the Opp team.I have been tried Process builder and Apex coding.but it couldn’t working on it ,is it possible with flows? Been working on something similar but with no luck I am trying to update a Lead date/time field based on the last completed Task date/time. For some reason, I can not capture the Lead ID with the associated Task. Did my image post ok? Can you please explain how the account Id was populated? I didn’t see that it was passed using the custom button. I tried the “Visual workflow game changer for Salesforce admin/developer” but did not work as expected. dont know what I missed ? did it exactly as instructed. ? is there any permissions etc I need to turn on. Can you please post the screenshots ?